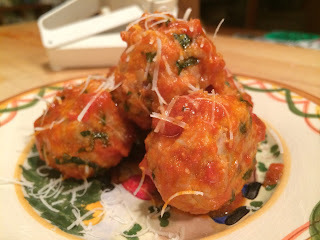 Ricotta makes lots of things just that much better and these pork meatballs are high on the list. Whether you’re craving spaghetti and meatballs, meatball soup, or fried meatballs give these ricotta enhanced meatballs a try. In a large bowl stir together a cup of ricotta, a third of a cup of grated parmesan, a half cup of panko, a lightly scrambled egg, a teaspoon of kosher salt and half a teaspoon of pepper. Mix in a about a pound and a half of ground pork and a splash of milk then form into balls. Brown completely in a hot pan then add to your tomato sauce, soup, or deep fryer to finish. Comfort food at it’s best!